Bremont and British aviation company Martin-Baker came together to design and build the ultimate aviation watch. Embodying the theme of ‘Made in Britain’, the new Bremont Martin-Baker collection focuses on the best of engineering and combines Bremont’s watchmaking skills with Martin-Baker’s world-class knowledge of testing, materials and manufacturing. The watches have been created to withstand the most rigorous of environments, especially the forces and damage inflicted when a pilot is ejected from their plane. We’re proud to stock the new sophisticated Bremont timepieces that are the epitome of luxury and fine watchmaking. First founded as an aircraft manufacturer before becoming a pioneer in ejection seat technology, Martin-Baker is responsible for supplying 70% of the world’s Air Forces with seats; as of yet, the company has saved the lives of 7,597 pilots with their ground-breaking technology. Martin-Baker seats have been fitted into more than 200 fixed-wing and rotary types of aircraft; the most recent application is the Lockheed Martin F-35 Lightning II programme. The company began to explore ejection seats from 1934, years ahead of others, and came up with an explosive-powered seat as a solution; after ejection, the pilot separates from the seat and opens the parachute by pulling a ripcord. Initially, no one was aware of how much G force people could tolerate, so tests had to be done to ensure pilots would be able to handle the accelerations involved. In 1945, Bernard Lynch, one of Martin-Baker’s experimental fitters, underwent the first human test; the mechanism was improved after he expressed discomfort. The first live test occurred in 1946 when Lynch ejected himself out of a modified Meteor 3 aircraft flying at 320 miles per hour and at an altitude of 8,000 feet. His landing was perfect, and he went on to make a further 30 ejections for Martin-Baker. Bremont is a relatively new company, only founded in 2002, which made some wonder why Martin-Baker chose them for their collaboration instead of watchmakers with a more extensive heritage. One of the main reasons for this partnership is that both companies share similar values; Bremont’s focus on aviation, high-quality design and engineering couldn’t have been more fitting to what Martin-Baker seeks to achieve. This relationship between the companies is iconic and celebrates innovative and pioneering British engineering. Martin-Baker first approached Bremont in 2007 to create the ultimate aviation watch. In 2009, the Bremont MBI and MBII were born; now, a decade later, the watchmaker is celebrating the collection’s 10th anniversary with the release of the much-anticipated Bremont MBIII line. While the limited-edition MBI is exclusive to pilots who have ejected from an aircraft using a Martin-Baker seat – and who are now members of the Ejection Tie Club – the MBII and MBIII models are available to the public. The MBI is a unique and bespoke model that can be easily identified by its red aluminium barrel. Each watch in the line has been carved with a personal engraving of up to ten digits, which consists of the pilot’s call sign, name or date; the piece also features the individual’s membership number in the Martin-Baker’s Ejection Tie Club. The MBI is a BE-36AE automatic chronometer and comes with 38-hour power reserve; the 43mm hardened stainless steel Trip-Tick® case further adds to the durability of the model, which is also water-resistant up to 100 metres. ‘Tested Beyond Endurance’, Bremont’s motto, perfectly describes the nature of the MB, as these pilot’s watches have been designed to withstand everything the pilot does. The pieces in the collection endured 12-30G throughout the first second of ejection and were the first to go through a live ejection seat testing programme. The new MBIII retains the classic DNA of the line and adds a new GMT movement capable of keeping time in two different zones; these models have undergone the same extensive testing as their predecessors, from temperature extremes to vibration tests. They come with shock protection and an outer case hardened to 2,000 Vickers, equivalent to a nine in the Mohs scale of hardness. The ‘Faraday Cage’ protects the movement from magnetic and electrostatic forces. The Bremont MBIII/WH 10th Anniversary watch is limited to just 310 pieces and is the perfect model to celebrate the decennial of the introduction of the first MB model. This white-dialled piece has a 43mm stainless steel case and is a self-winding C.O.S.C.-certified chronometer with a water resistance of up to 100 metres. The MBIII/WH model also comes with anti-reflective, scratch-resistant sapphire crystal that makes it suitable for both aircraft cabins and everyday wear. The decorated case back has a limited-edition Martin-Baker MK16 Ejector Seat engraving and six stainless-steel screws with polished heads, which further adds to the luxurious exclusivity of this watch. 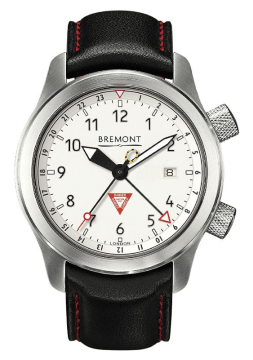 The stunning Bremont Martin-Baker collection has redefined the aviation watch world. All of the watches in the range have been tested in severe conditions to ensure their sturdiness and durability, so you know you’re getting a timepiece to last a lifetime. Visit our Lancaster and Kendal stores to see this stunning collection or to browse our other Bremont watches.